Chef Jody Adams has been one of the central figures of the Boston cooking scene for over 20 years. She is currently chef and owner of Rialto in Cambridge, which she helped to open in 1994. She wrote the wonderful cookbook, In the Hands of the Chef, with her husband, Ken Rivard in 2002. She is also mother to Oliver, 19 and Roxanne, 13. I recently interviewed Chef Adams. She is simultaneously thoughtful, humorous and engaging. She speaks at a deliberate pace that made me want to lean over and listen. She provided me with valuable advice for finding a balance between supporting my children and helping them to develop their own identities. From our conversation it was evident that her social justice work with Partners in Health, Share Our Strength and the Greater Boston Food Bank is an extension of who she is. She is not doing it for the accolades, nor for public recognition, nor for her children. Instead, it is clearly from a place of deeply understanding her place in the greater community. The desire to weave worlds together also was clear as she talked about Guerilla Grilling and her blog. About a year ago, she came up with the idea to take her entire staff to meet with the suppliers and providers of her ingredients. Together, they make a meal and join together. The result-the Guerilla Grilling team. It is another example of how Chef Adams bridges worlds and brings people together. And, in fact, to pull people in is what the table is about for her. A meal is a center of connections. She is an inspiration for all of us. She is so articulate that I have decided to simply share her words. I couldn’t say anything any better than she said it herself. FoodieMommy: Do your children [ages 13 and 19] enjoy food? 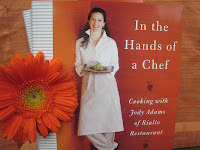 Chef Jody Adams: Last night we ate dinner at the restaurant [Rialto.] My husband grilled lamb chops and I made potato salad. My daughter said, “What is the cheese tonight?” And she went in the kitchen and she put cheese on plate. This guy out in Western Mass. is providing honeycomb in small frames for chefs to sample. And she added to the plate. So, we are scooping it on the cheese and I thought, “It worked. We are here. They eat everything.” My children rarely will eat junk food. But we weren’t super rigid about that because my feeling was that as long as there was a safety net at home and we weren’t bringing it into the house, we were laying the foundation. The world is going to present itself forever. So if you completely control your child and do not allow them to have “bad food,” then you run the risk of setting up a dynamic that you don’t want. What advice would you give to parents who want to create good food habits in their children? I think there are a couple of things to establish: 1) Let the drink of choice is water. There is no reason to drink juice. 2) Do not bring anything into the house that you don’t want kids to eat. And know that you can’t control what they eat outside the home. 3) We cooked what we as parents wanted to eat. What I did means that you have to be willing to wash dishes. Each night we set out a number of options. There was a protein and many different vegetables and grains. The expectation was that my children had to try everything once. They never had to eat everything on their plate. It was really about offering variety and just making the table a safe and comfortable place and having stories to tell about food and where it comes from. I think eating shouldn’t be prescriptive in my mind. It is a time to bring people around the table and where kids learn how to be social, how to be civilized and how to share. If you give a kid broccoli rabe when they are 6, they are not necessarily going to like it. But if it is part of what surrounds them, through their life, by the time they are 19, they will love it with garlic and hot pepper flakes. It took my son long time to get used to it. I think that often what happens is that parents give up. They say, “My kid doesn’t like broccoli rabe.” And they give up. Sometimes I think maybe I was blessed with children with palates that adapt. But I also think it is important to make the investment early, to bring them around the table and they will get used to it. As you raised your children, did you have a garden? Did you cook for them? I don’t have a garden. I am terrible at it. I only grow children. I never cooked for them. I felt that it was not a good idea for me to impose on them what takes me away from them. And that is cooking. But by osmosis, they have learned about food and appreciate and know how to cook. My son knows more about cooking them any of his friends. But he doesn’t come home and say, “Mom, let’s cook together.” My husband is a very good cook. It is nice because we eat lots of whole grains and heirloom vegetables. Have you tried to involve your children with the community service that you do? There is nothing like touching poverty. I think it is so important because poverty is not scary. It is a question of birth. There are levels of poverty, and what we saw [when she and her son traveled to Rwanda] was a family with a child with a bloated belly. And clearly this kid wasn’t getting enough protein. And yet, it was so clear that this was a young couple who adored this child, just as I adore my son and my daughter. You once said that your mother was an “adventurous cook.” What did she cook for you? My mother did cook, but she also worked full time, so we would have meatloaf and baked potatoes one night and liver another night…We ate a lot of fish and we ate some spaghetti and chilis and things. But she really worked on a budget…My mother was a very sensible and careful shopper. She cooked and everything was made from scratch. She made bread and yogurt. There was not a lot of processed food. Graham crackers were the treat. What was your inspiration for Guerilla Grilling and your blog? I had gone to different farms myself, but I realized that my staff doesn’t know them and we are right here in a building and the kitchen is very stainless steel. It is not like the kitchen is open and has a garden and…I though, just wouldn’t it be great…So we decided to start doing that once a month. It is a great way to actually work with food in the moment, without the barrier of a restaurant…And for cooks and wait staff and runners and managers to be together and the people who work wherever we have gone. Sometimes the writing is so hard and you have to ask, “Where is the story?” That is what my husband taught me. You have to tell the story of the person because that is what is interesting. And I think that is really what drives me. It is not just about what is the most beautiful plate that I can provide? It is about: what are the relationships? The stories? the experiences? What are our customers doing? Who are the purveyors that surround us? Because we are part of a community, both physically and through the cyber world. Thank you, Chef Adams, for taking the time to meet with me. For the rest of you, even if you can't make it to Rialto, check out Chef Adam's cookbook, In the Hands of a Chef. Lastly, I highly recommend her blog, In the Hands of a Chef, for the gorgeous photos, the lovely stories and delicious recipes. In one of my favorite posts, Chef Adams describes her son's love of grilled cheese at ages 3 and 17.